Viz Media isn't going to let the lackluster reception Xbox 360 RPG Blue Dragon received in here in the states keep them from licensing the hell out of the property. Today they've announced a partnership with Konami Digital Entertainment to create and distribute a Blue Dragon collectible card game throughout North America, making that one aisle in Walmart just a bit more blue. Excited? No? Well KDE's Card Division VP Yumi Hoashi definitely is. "We look forward to reaching out to an array of players of all ages and sharing the excitement of the group-oriented role playing card game, Blue Dragon. It is our expectation that the character designs of esteemed creator Akira Toriyama, combined with the unique game play of Blue Dragon, will create countless new fans within the card game community." Make no mistake, Blue Dragon was an extremely proficient, well-crafted RPG. It just happens to also be so by-the-book and boring that even writing about a CCG based off of the game is putting me to sleep. San Francisco, CA, June 18, 2008 – VIZ Media, LLC (VIZ Media), one of the entertainment industry's most innovative and comprehensive publishing, animation and licensing companies, and Konami Digital Entertainment, Inc. (KDE), a leading publisher of mass market video games and manufacturer of trading card games (TCG), today announced that KDE will exclusively manufacture and distribute the BLUE DRAGON Trading Card Game and Trading Card Game Accessories in North America. The agreement further extends the scope and popularity of the BLUE DRAGON franchise. 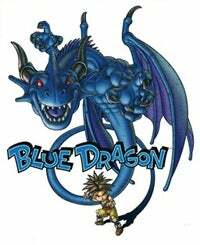 VIZ Media is the master North American licensor for the television, home video and non-video game merchandising rights for BLUE DRAGON. The BLUE DRAGON animation is based on the Xbox 360 video game Blue Dragon, developed by Hironobu Sakaguchi, the creator of "Final Fantasy", and featuring character designs by Akira Toriyama, the creator of the best-selling DRAGON BALL series of manga (which is published in North America by VIZ Media and featured in SHONEN JUMP Magazine). The new trading card game is also based on the Xbox 360 video game. The animated series debuted in Japan on TV Tokyo on April 7, 2007 and is produced by Studio Pierrot, which is well known for its work on NARUTO and BLEACH, also licensed by VIZ Media. The highly anticipated BLUE DRAGON animated series, rated TV Y7FV, debuted across the United States on Cartoon Network on Saturday, April 5, 2008 and now airs regularly at 9 a.m. on Saturday mornings. The BLUE DRAGON video game and animated series is a classic adventure story of magical Shadow powers, flying air fortresses, and unbounded heroism! Brought together by fate, Seven Soldiers of Light must awaken the Shadow within themselves in time to overcome a despotic power and bring peace to their land. Their ensuing journey through a rich fantasy world is also an internal journey to awaken the great power within each of them. Journey with them into the world of BLUE DRAGON! "Konami Digital Entertainment, Inc. welcomes the opportunity to further build the popularity of the BLUE DRAGON franchise with this licensing agreement with VIZ Media and is thrilled to have the opportunity to work on its first ever role playing card game with a dynamically advancing game mechanic," said Yumi Hoashi, Vice President, KDE's Card Division. "We look forward to reaching out to an array of players of all ages and sharing the excitement of the group-oriented role playing card game, Blue Dragon. It is our expectation that the character designs of esteemed creator Akira Toriyama, combined with the unique game play of Blue Dragon, will create countless new fans within the card game community." Konami Digital Entertainment, Inc. is a leading developer, publisher and manufacturer of card and electronic entertainment properties. The most notable of KDE's card genre is the wildly popular Yu-Gi-Oh! trading card game, which is welcoming its 10th anniversary this year. In addition to Yu-Gi-Oh!, KDE's other titles, although released only in Japan, include such hits as The Prince of Tennis, D. Gray-man, MÄR, Eyeshield 21 and more. "The creative forces behind BLUE DRAGON include some of the most notable talents from the worlds of gaming, animation and manga/graphic novels," says David Rewalt, Senior Director - Licensing and Retail Development, VIZ Media. "The continued development of BLUE DRAGON from a video game to an animated series and now a Trading Card Game demonstrates the successful convergence of all these entertainment and media genres. With established legacies in these arenas, VIZ Media and KDE will continue to develop the BLUE DRAGON brand through a variety of innovative and fun products."